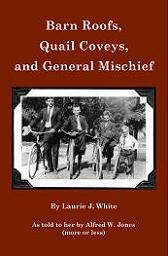 Three short tales from a mischievous boyhood in the 1920’s in the small, north Georgia town of Dalton. They are told from the perspective of my dad, Alfred Jones, as he told them to me. I had heard these stories all my life, but shortly before he died, I interviewed him to get more of the details. Following the stories, a section of History Tidbits offers entertaining background facts on related topics, such as shooting marbles, electric cars, and shoveling horse manure in New York City in 1920–it was everyone’s hope that the car would clean things up! Student page–fun links related to the stories for your student (and you) to explore. The Student page gives more fun background information to topics mentioned in the book–an expansion of the History Tidbits in the book but with the advantage of using links where you can actually SEE things! Like you can let Jay Leno show you around his genuine 1909 electric car and go for a ride with him, or learn to play marbles from a YouTube video.